Malinda Larkin tells us of a move by the Animal and Plant Health Inspection Service (APHIS) that worsens the ongoing campaign to eliminate the soring of horses. (Please see the Journal of the American Veterinary Association at https://www.avma.org/News/JAVMANews/Pages/170401e.aspx.) APHIS has removed information from its website that is vital to researchers, pet stores, animal rights activists and Congress. What type of information is gone? Larkin writes, “reports and documents providing information on compliance with the Animal Welfare Act and the Horse Protection Act.” The AWA of 1966 regulates the treatment of animals in research and exhibition, while the Horse Protection Act of 1970 is much more powerful. This federal law looks upon soring as a crime punishable by both civil and criminal penalties. It is illegal to show a horse, enter it at a horse show, or to auction, sell, offer for sale, or transport a horse for any of these purposes if it has been sored. As you can imagine, the data that used to be at the APHIS site is wide-ranging, and what makes the removal of it so egregious is that the agency removed the information without any prior notice. APHIS claims it had to be done for reasons of transparency and individual privacy. Larkin says that starting last February 3, whoever pulled up the site was unable to read such valuable information as inspection reports, annual reports, and enforcement reports. APHIS has since put back some information and says that those requesting information should use the Freedom of Information Act. It is impossible to divorce this issue from political arguments that seek to keep the public from learning the truth about who has been taken to court and fined for soring, or whether a sorer has gone back to soring after he paid a small often inadequate fine, or who have been violators of federal laws in the past. Much of the raw data needed for effecting change in the laws is gone, and the affected horses continue to be tortured. 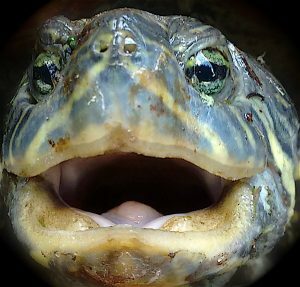 When this picture of the glorious, laughing turtle first appeared in my computer, I let out a huge, loud sound that can only be described as a guffaw. As I looked closer at his picture, I smiled and smiled. It took a while for me to settle down. No one who knows me would ever describe me as capable of a guffaw. What caused me to go to pieces over this turtle’s face? At a more rational time later, I called Laura Krakowiak who took the picture and sent it to me. A country dweller, she thinks that the turtle might have been a female and was grimacing because she had eggs in her body and someone was disturbing her. On the other hand, I prefer to think of this animal as a “him,” who is grinning, not grimacing. Curious, I asked Laura how she came to take the picture. One day, she heard her three dogs outside, barking “like crazy,” Laura said. She ran outside to find the object of their hysteria. There it was: a turtle lay by the fence that separates the cultivated back yard from a woody area with a pond. As the vigilant dogs kept broadcasting their discovery, Laura got a pail from the barn and put the turtle in it to save it from the dogs. Then, a sudden idea. Why not photograph it, add it to her portfolio of outside creatures? She gave the foot-long animal to her teen-age son to hold securely, and choosing a close-up vantage point, took the picture of the turtle’s face. Then she put the turtle back into the grass where the dogs had spotted him, quickly chasing the dogs inside. Once in the house, she attached her camera to her computer to access the portrait. Outside, the turtle disappeared from the scene. I like to see pictures of animals that have been artfully photographed as they really look: I’m not a fan of dogs playing cards or cats in baby bonnets. Once you see animals up close in photographs, I’ve noticed that every detail of their real appearance is often exposed, and the animal gains a unique identity. Many look different from the way we usually think of them. Take this turtle. This magnification of his face enabled me to notice the harmonizing colors and components of his face that he’s been given by nature or natural selection if you are a Darwinist. I’m drawn to the green lids on his eyes, eyes that appear to be dark brown. His head, I notice, is gray, yellow, and brown in his nostrils, eyes, and mouth. See that triangular pattern above his wide, wide mouth? His nostrils are at the top of the triangle; its edges are beige, white, and cream. I wondered what kind of turtle he is and decided on the Eastern Box Turtle. I admit I’m still drawn to Turtleface, a name by which I refer to him. I look again at that happy smile and wonder why he is grinning, the fact of his grin, making him, in the last analysis, an animal to which we can relate, even though he is a turtle. Here’s where being a novelist comes in handy. I can easily imagine him thinking, “So now you see me in my real appearance. Not that piddling little creature you all have seen as I make my way slowly along, hampered by my shell. You think that’s all there is to me. I’m pretty powerful because I have infinite patience to achieve the goals of my species. I will live a very long time. And I am thought to be wise.” Maybe Turtleface is expressing joy that he has survived the indignity of being put in a pail. Because he has survived the approaches of three yapping, furry things that called attention to his presence when he wanted to be let alone to go on his labored way and not be tortured by other creatures who do not possess his attractiveness. For obviously, he must think he is attractive. And because he’s thankful that Laura has enabled him to survive. Accustomed to hiding his face as he stumbles along the paths that take so long to traverse, I don’t think Turtleface minds at all that we have seen that fantastic face and might even think it beautiful. Not long ago, I got a film that its sender thought was perfect for me: he knew that I have always been fascinated by falconry, the sport of hunting with hawks. I’ve read about it in non-fiction, poetry and novels, and each time, wondered how the birds are trained and how they find their master on the ground. In a new SONY documentary, “The Eagle Huntress,” a thirteen-year-old Mongolian girl, Aisholpan, is inspired to become an Eagle Hunter herself by watching her father train a Golden Eagle for hunting and also for competition. Her father has won the national sport twice. Only males have been eligible to trap a young Golden Eagle in its nest in the mountains, take it back home, and start training it to hunt. The girl asks her father if she may learn this skill. Surprisingly, he gives his wholehearted approval and helps her achieve her dream of flying an eagle. There are elders in the village, of course, who do not approve of the girl becoming an eagle hunter. The photography of the harsh terrain shows us the steppes, the flights of the great eagle, close-ups of its eyes, the swiftness of its flight, sounds of the training as the girl makes a strange sound to the eagle which it recognizes as “Come to me,” and the unmistakable joy the father and daughter feel as they bravely set out together as companions on a quest to tame the great bird. The camera often lingers on Aisholpan’s face and no wonder: she is beautiful. The camera work is precise and unyielding as to detail. I quite literally couldn’t take my eyes away from this film. The work training the bird is so arduous that I kept thinking, “She must win the contest after all this.” I won’t tell you here what happens. Kenneth Turan, critic of the LA Times, has written a heartfelt appreciation of this marvelous film, which I include here. No one else could write more truthfully or accurately of “The Eagle Huntress.” I urge my readers to get the film. It is already earning prizes. And by the way, it is a fine family film. Tireless workers to bring about the abolition of soring horses found recently that the United States Department of Agriculture (USDA) has withdrawn from its website invaluable information for those who are fighting against horse soring. The following information was removed two weeks into the new administration. Researchers can no longer look at inspection and violation information, reports of animal research labs, enforcement action, and information about owners and trainers, information with a direct impact on the Animal Welfare Act and Horse Protection Act. The USDA responded to the protests by saying that it was also removing “certain personal information,” an ambiguous statement. The bad news continued. Where they were formerly able to access information immediately so that their work to protect horses could proceed smoothly, HSUS workers now found that every time they want facts, they have to submit requests through the Freedom of Information Act; this is a notoriously slow procedure, instead of instant information, information in months or years. Previously, researchers could look up information about 9000 places where horses are found. At this point, every reader must be saying as they read this, why is this happening? Karen E. Lange of the Humane Society writes, ” it may have been partially the result of a lawsuit filed in 2016 by Tennessee walking horse owners in Texas, who alleged the USDA was violating due process and privacy rights by posting inspection and violation records online.” How much does the Contender Farms lawsuit’s legal action have to do with the USDA’s review of its posting this information? One particularly hurtful effect of all this was that the horse soring bill that put teeth in the Horse Protection Act was nearly finalized when the Obama administration was over. If it had only been published in the Federal Register! That rule which would have done so much to help horses, is, at present, without an assured future. Meanwhile, two horse protection bills remain, waiting to be reintroduced. They are the Safeguard American Food Exports Act, a ban on horse slaughter in the United States and abroad, and the Prevent All Soring Tactics Act which would make illegal the abuse of Tennessee Walking Horses. And the recalcitrant USDA has unbent enough to release some reports and limited inspection information but only for “small subsets of licensed and registered facilities….” And the crowning blow is that the records for many horse trainers are still hidden. In 1987, a new series called “Beauty and the Beast” started broadcasting on CBS. I was one of many viewers tuning in that evening, hoping that this newest version of the old story would have some merit. I knew that I would have to accept the story by suspending my disbelief. I had become adroit at this ability since I had been a literature major for a long time, and knew how to use it to understand a work of art which could not reasonably be experienced in terms of reality. In other words, a fantasy. I had read Samuel Taylor Coleridge’s explanation in which he explained the need for a mental adjustment of our thinking that he called “a willing suspension of disbelief for the moment….” Here’s what he wrote in 1817. Notice that he says that his poetry was going to contain “persons and characters supernatural, or at least romantic….” By “romantic,” he did not mean romantic as in love, but having no basis in fact. So now, sitting in my living room far away from my present home, I slipped into Coleridge’s state of mind so that I could fully experience what Ron Koslow, writer and producer of the series, and the actors who were portraying characters in Beauty and the Beast were showing their audience. By far the greatest stretch of mind was accepting the basic premise of this fantasy: that a place could exist underneath New York City peopled by outcasts of many kinds, and that among them, a “person” named Vincent, whose face was terrifying, who could be described as a mythical monster with superhuman strength, really lived among them. I would have to really believe in Coleridge’s “shadows of imagination” to order to appreciate what the Mr. Koslow was trying to help us experience. This temporary assumption of disbelief in our minds, even though temporary, is not easy for many people to summon. I’ve found that many people insist that nothing like that could exist in the real world they know. So fiction itself does not bear examination. In cases like this, I say gently that truth can exist in fiction, even in fantasy or mythology. In the case of CBS’s show, I found on first viewing that the plot revealed elements of real life as it progressed, that shone through the plot. Here is a short account of that first episode. Catherine Chandler is a beautiful socialite in 1980s New York. She is stabbed and disfigured and collapses. Her face bandaged, she wakes in a strange place, definitely not a hospital, attended by a person with a kind voice, who reads a Dickens novel to her. She comes to depend on this person, but one day, after the bandages are removed, she sees, by accident, who the reader is. That person is Vincent, the adopted son of the man who is the organizing energy behind the collection of people in the underground community. Vincent’s father is known by everyone as Father, because he acts in the role of a loving father to all those who live under the ground. Vincent has been trying to avoid her finding out what he looks like. She screams. His reaction is a hiss of despair. When we as viewers see him, we too, along with Catherine, are frightened. Vincent is very tall, with a flowing yellow mane of hair, a cleft palate which affects a telltale split in his upper lip through which teeth are visible, and heavily furred hands. He gives every appearance of strength and physical agility. When later in the series he comes to Catherine’s aid, it does not surprise us when he literally goes through a roof or hurls himself through a window to get to her and pummel her assailants, or when he has to go somewhere in New York and rides a subway to get there, clinging to the roof of a car. Catherine displays bravery and honor by not making this mistake again, eventually accepting that he is an estimable person who is highly cultured in many fields including literature, music and philosophy, whom if he had a normal face, she would enjoy talking to in the New York art world. And more: he is comforting and telepathic, and the two feel a bond of shared suffering. The series unfolds with Catherine going home and undergoing plastic surgery to get rid of the scars and taking on the job of a lawyer in the district attorney’s office. She is tasked with looking into cases of New Yorkers who have been victimized. Once she is home in a new apartment in which she lives alone, she has deserted her wealthy home with her father, she cannot forget Vincent. He must see her, and starts appearing on her balcony overlooking the gorgeous spectacle of a lighted New York, and they talk. Knowing she will be in danger much of the time from the cases she takes on, she takes lessons in defending herself physically from an enemy, so that she is not a “helpless woman” so commonly seen in movies and television. Vincent is her defender. The special effects of the underground community were fascinating as I watched the program that evening long ago. This was before the age of computer generated imagery, and the creativity the designers put into this colony under the streets of New York adds to the sense of wonder I felt. On the one hand, New York is depicted as it was in the 80’s, the bustling overcrowded city with many dangers, contrasted with what it’s like below the streets. Father rules over a huge underground place, where books are everywhere because everyone reads, people manufacture distinctive clothing at sewing machines, and a system of primitive Morse Code prevails by which the inhabitants tap messages on pipes, which helps them keep track of each other no matter how far away they are at the time. There is a waterfall under the ground, and bridges constructed by the inhabitants, and in one scene later on, we see Vincent poling Catherine in a craft down an underground river. Dressed in his habitual cloak, he looks like the ferryman poling a visitor to hell along the river Styx. The inhabitants are of all ages. They have their own ceremonies, like the baby-naming ritual or a modest celebration if one of the young people accomplishes something. A reader, who grew up with far more sophisticated CGI sets in movies, said this with respect to the underground set: “That show could never be made the same way today. On the one hand, it could be made with far superior sets and effects–imagine the underground world with all the CGI at the show’s disposal. Far more rich and compelling.” Yet for the time, the underground was compelling, and the reader was enchanted with the program. In contrast, New York City was very much as it is today, with crowds of people everywhere, strange shops in various zones of nationality, heavy traffic, overcrowded with buildings of many designs, the waterfront, and everything that makes this city still one of the most fascinating places in the world. But it is the place where evil is rampant, and Father knows this well. That is why he does not want anyone to leave the underground colony. Discovery by outsiders means disaster. Of all the versions of the ancient tale of Beauty and the Beast, this is the best, because it has deep meaning for human beings. Yes, even though one character is a man, even though he is deformed. The story dramatizes deep problems of human beings that are always present. One problem is falling in love with the “wrong person” and the consequences. Another is the treatment of people by using violence against them above ground. An evil still with us in 2017. In this version, business leaders are portrayed as determined to destroy their opponents, no matter what it takes, and form evil syndicates. Another theme is false religion which even when calling itself a religion, destroys its adherents unless they believe. Another problem of human beings is shown: misplaced trust. It is apparent that the people who produced and wrote these episodes were familiar with the finest in western literature, mythology, philosophy and music. The viewer hears these things spoken by the people underground with love and reverence, and it reminds us that human beings are capable of great things which are inspirational. When Vincent reads or recites Shakespeare aloud to express his love for Catherine, we too are transported. The actors and writers come to their roles with a wealth of experience. All of them do their finest work in this series. Here follows an appreciation by one of the writers, George R. R. Martin. Mr. Martin, who is active in writing today, had important things to say about his work on the show and also explain why the series came to a premature ending. Go to http://www.hollywoodreporter.com/live-feed/george-r-r-martin-writing-tvs-beauty-beast-was-a-smart-show-986786. Let’s finish with another appreciation, by Ron Perlman this time, who is an active actor today. His role of Vincent can never be equaled. Go to http://www.hollywoodreporter.com/heat-vision/ron-perlman-starring-tvs-beauty-beast-was-feeling-i-had-growing-up-987002. And last a personal note for my readers and my friends. I’ve enjoyed tracing the history of Beauty and the Beast for you all. I urge you to read any of the versions that appeal to you, but also to include the CBS series. The series can be seen online or is available in DVDs. Please free always to contact me about anything I write about in my blog.